(Money Magazine) -- Not so long ago debt "was a four-letter word when spoken in the same breath as "retirement." Before waltzing into their golden years, older Americans paid off their loans, then celebrated by burning the mortgage. Now a third of folks 65 and older have a mortgage vs. 20% two decades ago, according to recent Census data. Median balance: $56,000. Meanwhile, seniors 65 and up carry an average $10,235 on credit cards, think tank Demos reports. The affluent are not immune, either. Among households headed by those 65 and up with incomes over $100,000, 25% have nonmortgage liabilities, says the Center for Retirement Research at Boston College. You don't have to be totally debt-free before your golden years, to be sure. But financial planners caution that too much red ink, and the wrong kinds, can diminish your standard of living. See how you'd manage. Remember that your income is likely to decline once you leave the workforce. "You don't want to go into retirement with more obligations than you can honor," says Gail Cunningham of the National Foundation for Credit Counseling. So use T. Rowe Price's Retirement Income Planner to estimate what you'll get annually from pensions, Social Security, and investments. Then total up the monthly nut on mortgages, car loans, and other installment loans; add on what it would take per month to pay off your credit card in three years and your HELOC in five (you can use CNNMoney's debt-reduction planner to calculate both). Divide the sum by your projected monthly income. In your working years, you shouldn't spend more than 25% of gross income on mortgage debt, 10% on other debt, says financial planner Phil Dyer of Towson, Md. In retirement, when you're living at least partially off your investments, he says, your mortgage should consume no more than 15% of income, other debt 5%. Think you'll be above that? Speed up paydown in the years before quitting. 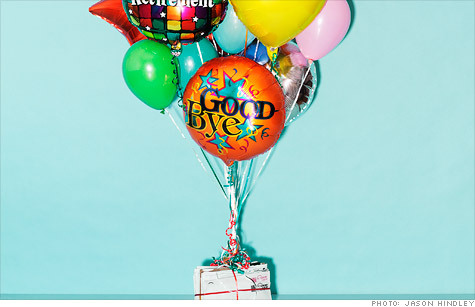 You may also have to work longer, take on a job in retirement, or move to a less costly home. Eliminate the worst bad debt. Just because you could handle your debt in retirement doesn't mean you should. In particular, try to wipe out credit card balances, advises Cunningham. Plastic usually carries the highest rates, now an average 15%. Since you're unlikely to get as high a return on your investments, you're better off taking a lump sum from savings to pay the bill. Rather not? Ask the issuer for a better APR or transfer the balance to a lower-rate card while you chip away at the debt. Once you've zeroed out cards, pay down other "bad" debts -- those that carry high rates, that aren't tax-deductible, or that paid for assets that lose value, like cars. Determine if good debt is good. In today's low-rate environment, as long as you can continue making payments on your mortgage, you may benefit from keeping the loan. This is especially true if your savings are mostly in tax-deferred accounts and you are still getting the interest write-off. The reason: Cashing in assets in tax-sheltered accounts to pay the balance will cost you. "Generally federal, state, and local taxes and possible tax penalties negate interest savings on the mortgage," says financial planner Michael Hohf of Southfield, Mich.
Have money outside tax-deferred accounts? "In the long run stocks should produce more than the 3% to 4% you're paying on your mortgage," says Indianapolis financial planner Elaine Bedel. So if your stash is in equities, you may want to let it ride. Or, wait until your yearly portfolio rebalancing -- and if your stock stake has risen above your target allocation, sell some equities and put the proceeds toward the debt, advises financial planner Michael Chasnoff of Cincinnati. For those whose money is mostly in low-interest, fixed-income investments, paying down the loan could be prudent. Says Hohf: "Ideally the lost mortgage payment should be greater than the lost income from the asset that you sold."